A few of General Westons recent accomplishments while on active duty include; Vice Commander, Electronic Systems Center, Air Force Material Command at Hanscom AFB, Massachusetts; Director of Advanced Systems and Technology, National Reconnaissance Office; Director, Corporate Operations Office and CIO for the NRO; and Program Executive Officer for Command and Control Programs at the Pentagon in Washington D.C. He has received the National Reconnaissance Office Medal of Distinguished Performance, the Supreme Medal of Ghazi Mohammed Akbar Khan from Afghanistan, the Defense Distinguished Service Medal with oak leaf cluster, Air Force Distinguished Service Medal, a Bronze Star, an Air Medal and others, all a testimonial to his love of country and service accomplishments. Now General Weston is the Chief Executive Officer of a new company dedicated to providing the U.S. government with reliable, cost-effective satellite communications that no longer require years and years of deployment. The name of the company is U.S. Space LLC and General Weston joins fellow former command officers and their executive roles with the firm  Lt. General Hamel and Major General Armor  what a superb brain trust! General Weston, you served for a commendable 33 years in the United States Air Force  looking back upon your command military career, is there any particular assignment that you are most proud of completing? Which of your many positions do you believe has given you the experience necessary to build a new company? I am fortunate to have had four assignments during my career that I really treasure. I was a flight test engineer firing the high energy laser on board the Airborne Laser Laboratory, the predecessor to todays Boeing 747 Airborne Laser. Also, I was the Mission Director for classified satellite operations during some very trying times during the launch stand-down after the space shuttle Challenger accident. Additionally, I was a major acquisition program director and created the Space Based Infrared System during a period in which the Department of Defense tried new business practices for which we were one of the pathfinders. And my last assignment in Afghanistan, in which I guided our coalition team in helping the Afghans create an entire department of defense from scratch, was particularly satisfying. From these and my other assignments I took away key learning experiences, so by the end of my career I had a toolkit of skills that help me work with others in building U.S. Space. With the Office of Military Cooperation under your command in Afghanistan, and the need to develop and train as well as sustain tens of thousands of individuals, how does this equate to your command of U.S. Space LLC? > The two positions are obviously of a different scale, in terms of people, infrastructure and funding but the common theme is the need to create an organization and its business processes, establish goals and then measure progress towards the goals. In both cases, the key ingredient for success is a group of talented, hard working people. In March 2006, you joined SRA International, a technology and strategic consulting services organization providing solutions to the federal government. You were the Vice President of the C4ISR command center, which worked closely with DoD and the intelligence community. Is this where you began formulating your ideas for a new, more flexible company that could supply communications solutions to the government, with lower costs of entry, maintainable ROIs, and expeditious delivery? I was recruited to U.S. Space by our two founders, Ed Horowitz and Mark Piegza. Ed was inspired to create the company after hearing a talk by General Cartwright when he was the commander of U.S. STRATCOM, in which he articulated the need for new business and operational models to more rapidly and effectively build, launch and operate our nations military satellites. In turn, I was attracted to the company by its unique business and operations model, the benefit of working with the extremely talented people associated with U.S. Space and the opportunity to serve the nation in another fashion by providing a much needed military capability. From the warfighter to the command officer, regardless of service, all desire the newest technologies delivered yesterday to help them counter opposing forces and to produce mission successes, all the while protecting our nation from hostile incursion. With communications deployment requiring many years, sometimes as much as a decade to fully implement, why do you believe U.S. Space can reduce such time requirements and bring solutions to the boots on the ground in a more immediate fashion? To get to space more quickly we are taking a low risk approach with proven technology, using a stable design and teaming with industry partners who have shown they can reliably deliver space hardware that works on orbit. We adopted designs and components that have already been successfully used in space, which will make building and operating our satellites faster and easier. Also, we intend to produce a number of satellites of the same design and apply the benefits of the learning curve to further reduce the time to orbit. And, we want to use solid propulsion rockets to lift our satellites to space, since solid rockets are far easier and quicker to get ready for launch than liquid fueled boosters. The warfighter will still get the benefits of technology infusion, because once a technology has been demonstrated on orbit elsewhere we can include it in our next block of satellites, like a technology refresh or update. How will U.S. Space accomplish their charter, and what roles do General Armor and General Hamel play within the company? What other personnel resources do you have in your possession to help bring your company to successful fruition? Are there any commercial firms at the ready to help U.S. Space reach its goals? U.S. Space relies on a number of individuals who are deeply experienced in military and commercial space to advise us as we move the enterprise forward. It is great to have individuals on our team of the caliber of Mike Hamel, who sits on our Board of Directors, and Jim Armor, who is an advisor to the firm. To build, launch, and operate our satellites we are drawing on the talents of our All American team of mid-tier space industry partners who are well-known and proven in the military, commercial and civil market place. We are already working with them on systems designs so we are definitely beyond the concept stage. With the Pentagons reputation of not cultivating the services of new companies, rather continuing ongoing relationships how can U.S. Space break this mold and bring their resources to the forefront? With your companys executive team, obviously their contacts and experiences will play enormous roles in helping achieve success  do you have both military and civilian contacts to help bring this about? We have been well received everywhere weve visited in the Pentagon. The decision makers who understand MILSATCOM and work with it on a daily basis recognize and are interested in the benefits our business and operations model can provide. I think they see us as a much needed complement to government provided MILSATCOM and the commercial SATCOM upon which the Pentagon is now so heavily dependent, both of which in combination are still not enough capacity to meet an ever increasing demand. How do you see MILSATCOM playing its crucial role over the next couple of years? Over the next five or so years? 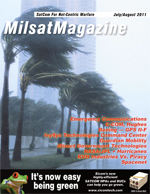 There is an almost insatiable appetite for MILSATCOM that will continue well into the future. The information rich battlefield envisioned by Network Centric Warfare has become a reality in the wars in Iraq and Afghanistan. It requires a reach back to the United States for massive amounts of data and information ranging for diverse needs like small unit operations, unmanned and close-in airborne surveillance and intelligence collection on the battlefields and logistics information pipelines for everything from personnel and medical data to spare parts, food and fuel shipment status. Larger fleets of more capable unmanned aerial vehicles and the requirements for communications on the move, demands for video and high definition video at lower echelons and other needs combine to constantly increase bandwidth requirements and the need for more MILSATCOM. Your companys tag line reads, Assured. Adaptable. Affordable. Accessible. American. High ideals, yet the Pentagon is an exclusive society. Even though you were a part of this world, do you, as of this interview, have any contracts in place with government entities or, how quickly do you believe U.S. Space can become an inside agent complete with actual signed agreements? A number of us who are a part of U.S. Space were also a part of the exclusive society of the Pentagon and have credibility within it, in offering a complement to the existing big military and commercial satellite programs. With the recent cancellation of TSAT, the rapid degradation of the UFO program, the still pending first launch of MUOS and with little excess bandwidth available on multi-user commercial SATCOM, the Pentagon is looking for alternatives like ours to help fill in the continuing gap between demand and available capacity. In this light, I think serious consideration is being given to our offerings. When your company indicates it will provide small satellites, what do you have in mind? Micros, Minis, Picos, Nanos? Our satellites will be small but provide medium capacity communications. We will be very cost competitive when the Pentagon considers our short production and launch timelines, ability to plug into the existing DoD MILSATCOM operations infrastructure, compatibility with existing military terminals and the means to place our satellites anywhere the DoD has open orbital positions. Will the satellites eventually become a new constellation for military and government purposes? U.S. Space will not replace the big military or commercial satellite constellations, which both fill vital roles for the DoD. Commercial satellites satisfy the DoDs need for high bandwidth and throughput needed for much of the militarys daily activities, for which the DoD does not have enough of its own assets to meet the demand. Military satellites provide protected communications (low probability of intercept, anti-jam and hardened) for specialized warfighting situations where there is no equivalent commercial demand or capability. There still remains the great need for unprotected MILSATCOM, where the DoD doesnt have enough capacity to satisfy the continuing and increasing demand. It is here that U.S. Space intends to augment or supplement the DoDs existing capability as long as there is a shortfall. How is your business and/or operations model different than that of other government or commercial satellite communications providers? Our hybrid business and operations model captures the best of both the military and commercial satellite worlds and adds something extra neither can easily provide. From the military aspect, we will produce military frequency payloads that can be placed in military orbit locations and managed just like any other DoD payload, in which operational users can use their existing terminals. These military features will help us easily integrate into DoD networks and ongoing operations. From the commercial side, we will use low risk, proven technology in productions lines that will enable us to deliver satellites relatively quickly. Also, we will privately finance the acquisition and launch of satellites so the government doesnt need to make any investment up front but merely pay a fee for service once the satellites are on orbit and available for use. How did you manage to raise your family while raising the level of professionalism within your command? How did you find the time to accomplish these major tasks? In addition, how does your family feel about your new position as the CEO of U.S. Space LLC? Like many in the military, I am fortunate to have a family that looked on our many moves around the country as an adventure that exposed them to new places, new people and new experiences. And it helps that they learned to be self-sufficient so they could survive and thrive during my many business trips and months long separations. I dont think my family is exceptional in that regard and we are asking much more of many of our military families today with repeated time away from home in the long deployments of our soldiers, sailors, airmen and marines. It is important that we recognize the sacrifice of their families, too!